Carbon dioxide is a chemical compound that is found as a gas in the Earth's atmosphere. It consists of simple molecules, each of which has one carbon and two oxygen atoms. Thus its chemical formula is CO2. It is currently at a concentration of approximately 385 parts per million (ppm) by volume in the Earth's atmosphere. It is a major component of the carbon cycle. In general, it is exhaled by animals and used for photosynthesis by growing plants. Additional carbon dioxide is created by the combustion of fossil fuels or vegetable matter, as well as other chemical processes. It is an important greenhouse gas because of its ability to absorb many infrared wavelengths of the Sun's light, and because of the length of time it stays in the Earth's atmosphere. In its solid state, carbon dioxide is commonly called dry ice. Carbon dioxide has no liquid state at pressures under 4 atm. Carbon dioxide is a colorless, odorless gas. When inhaled at concentrations higher than usual atmospheric levels, it can produce a sour taste in the mouth and a stinging sensation in the nose and throat. These effects result from the gas dissolving in the mucous membranes and saliva, forming a weak solution of carbonic acid. This sensation can also occur during an attempt to stifle a burp after drinking a carbonated beverage. Amounts above 5,000 ppm are considered unhealthy, and those above about 50,000 ppm are considered dangerous to animal life. At standard temperature and pressure, the density of carbon dioxide is around 1.98 kg/m³, about 1.5 times that of air. The carbon dioxide molecule (O=C=O) contains two double bonds and has a linear shape. It has no electrical dipole. As it is fully oxidized, it is not very reactive and is non-flammable. At −78.5° C, carbon dioxide changes directly from a solid phase to a gaseous phase through sublimation, or from gaseous to solid through deposition. The solid form is typically called "dry ice." Liquid carbon dioxide forms only at pressures above 4.0-5.1 atm, depending on temperature. 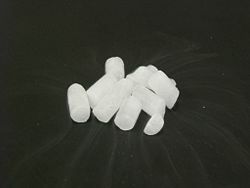 Specifically, the triple point of carbon dioxide is 416.7 kPa at -56.6° C. The critical point is 7,821 kPa at 31.1° C.
Small pellets of dry ice subliming in air. Solid carbon dioxide has the generic trademark "dry ice." It was first observed in 1825 by the French chemist Charles Thilorier. Dry ice is commonly used as a versatile cooling agent, and it is relatively inexpensive. 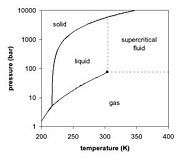 As it warms, solid carbon dioxide sublimes directly into the gas phase, leaving no liquid. This makes it convenient. It can often be found in groceries and laboratories, and it is also used in the shipping industry. The largest non-cooling use for dry ice is for blast cleaning. An alternative form of solid carbon dioxide, an amorphous glass-like form, is possible, although not at atmospheric pressure. This form of glass, called carbonia, was produced by supercooling heated CO2 at extreme pressure (40–48 GPa or about 400,000 atmospheres) in a diamond anvil. This discovery confirmed the theory that carbon dioxide could exist in a glass state similar to other members of its elemental family, like silicon (silica glass) and germanium. Unlike silica and germanium oxide glasses, however, carbonia glass is not stable at normal pressures and reverts back to gas when pressure is released. Carbon dioxide is soluble in water, in which it spontaneously interconverts between CO2 and H2CO3 (carbonic acid). The relative concentrations of CO2, H2CO3, and the deprotonated forms HCO3- (bicarbonate) and CO32-(carbonate) depend on the pH. In neutral or slightly alkaline water (pH > 6.5), the bicarbonate form predominates (>50 percent) becoming the most prevalent (>95%) at the pH of seawater, while in very alkaline water (pH > 10.4) the predominant (>50%) form is carbonate. The bicarbonate and carbonate forms are very soluble, such that air-equilibrated ocean water (mildly alkaline with typical pH = 8.2 – 8.5) contains about 120 mg of bicarbonate per liter. Carbon dioxide is used by the food industry, the oil industry, and the chemical industry. Carbon dioxide is used to produce carbonated soft drinks and soda water. Traditionally, the carbonation in beer and sparkling wine comes about through natural fermentation, but some manufacturers carbonate these drinks artificially. A candy called Pop Rocks is pressurized with carbon dioxide gas at about 40 bar (600 psi). When placed in the mouth, it dissolves (just like other hard candy) and releases the gas bubbles with an audible "pop." Leavening agents produce carbon dioxide to cause dough to rise. Baker's yeast produces carbon dioxide by fermentation within the dough, while chemical leaveners such as baking powder and baking soda release carbon dioxide when heated or if exposed to acids. Carbon dioxide is often used as an inexpensive, nonflammable pressurized gas. Life jackets often contain canisters of pressured carbon dioxide for quick inflation. Steel capsules are also sold as supplies of compressed gas for airguns, paintball markers, for inflating bicycle tires, and for making seltzer. Rapid vaporization of liquid CO2 is used for blasting in coal mines. Carbon dioxide is the most commonly used compressed gas for pneumatic systems in combat robots. Carbon dioxide is ideal for this application because at room temperature it becomes a liquid at a pressure of 60 bar. A tank of liquid carbon dioxide provides a constant 60 bar pressure until the tank is close to being empty. A tank of compressed air would gradually reduce in pressure as it was used. Liquid carbon dioxide is a good solvent for many organic compounds, and is used to remove caffeine from coffee. First, the green coffee beans are soaked in water. The beans are placed in the top of a column seventy feet (21 meters) high. The carbon dioxide fluid at about 93 degrees Celsius enters at the bottom of the column. The caffeine diffuses out of the beans and into the carbon dioxide. Plants require carbon dioxide to conduct photosynthesis, and greenhouses may enrich their atmospheres with additional CO2 to boost plant growth. It has been proposed that carbon dioxide from power generation be bubbled into ponds to grow algae that could then be converted into biodiesel fuel . High levels of carbon dioxide in the atmosphere effectively exterminate many pests. Greenhouses will raise the level of CO2 to 10,000 ppm (1%) for several hours to eliminate pests such as whiteflies, spider mites, and others. In medicine, up to 5 percent carbon dioxide is added to pure oxygen for stimulation of breathing after apnea and to stabilize the O2/CO2 balance in blood. 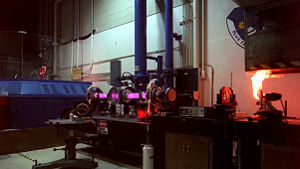 A common type of industrial gas laser, the carbon dioxide laser, uses carbon dioxide as a medium. Carbon dioxide can also be combined with limonene from orange peels or other epoxides to create polymers and plastics. Carbon dioxide is commonly injected into or adjacent to producing oil wells. It will act as both a pressurizing agent and, when dissolved into the underground crude oil, will significantly reduce its viscosity, enabling the oil to flow more rapidly through the earth to the removal well. In mature oil fields, extensive pipe networks are used to carry the carbon dioxide to the injection points. Liquid carbon dioxide (industry nomenclature R744 / R-744) was used as a refrigerant prior to the discovery of R-12 and is likely to enjoy a renaissance  due to environmental concerns. Its physical properties are highly favorable for cooling, refrigeration, and heating purposes, having a high volumetric cooling capacity. Due to its operation at pressures of up to 130 bars, CO2 systems require highly resistant components that have been already developed to serial production in many sectors. In car air conditioning, in more than 90 percent of all driving conditions, R744 operates more efficient than systems using R-134a. Its environmental advantages (GWP of 1, non-ozone depleting, non-toxic, non-flammable) could make it the future working fluid to replace current HFCs in cars, supermarkets, hot water heat pumps, among others. Some applications: Coca-Cola has fielded CO2-based beverage coolers and the U.S. Army and others have expressed interest . Carbon dioxide is present at a very small 383 ppm (0.000383) of the volume of the earth's atmosphere, but it is a very powerful greenhouse gas and so has a large effect upon climate. It is also essential to photosynthesis in plants and other photoautotrophs. Despite the low concentration, CO2 is a very important component of the Earth's atmosphere because it absorbs infrared radiation at wavelengths of 4.26 µm (asymmetric stretching vibrational mode) and 14.99 µm (bending vibrational mode) and enhances the greenhouse effect to a great degree. Although water vapour accounts a substantial fraction of the greenhouse effect, there is no real way to control the amount of water vapor in the Earth's climate system and it is short-lived in the atmosphere. In addition, water vapor is almost never considered a forcing, but rather almost always a feedback. On the other hand, carbon dioxide is a very powerful forcing, and it also lasts far longer in the Earth's atmosphere. With a radiative forcing of about 1.5 W/m2, it is relatively twice as powerful as the next major forcing greenhouse gas, methane, and relatively ten times as powerful as the third, nitrous oxide. Carbon dioxide alone contributes up to 12 percent to the greenhouse effect. The 20-year smoothed Law Dome DE02 and DE02-2 ice cores show the levels of CO2 to have been 284 ppm in 1832. As of January 2007, the measured atmospheric CO2 concentration at the Mauna Loa observatory was about 383 ppm. Of this 99 ppm rise in 175 years, 70 ppm of it has been in the last 47 years. Various methods of limiting or removing the amount of carbon dioxide in the atmosphere have been suggested. Current debate on the subject mostly involves economic or political matters at a policy level. Plants remove carbon dioxide from the atmosphere by photosynthesis, also called carbon assimilation. This process uses light energy to produce organic plant materials by combining carbon dioxide and water. Free oxygen is released as gas from the decomposition of water molecules, while the hydrogen is split into its protons and electrons and used to generate chemical energy via photophosphorylation. This energy is required for the fixation of carbon dioxide in the Calvin cycle to form sugars. These sugars can then be used for growth within the plant through respiration. Carbon dioxide gas must be introduced into greenhouses to maintain plant growth, as even in vented greenhouses the concentration of carbon dioxide can fall during daylight hours to as low as 200 ppm, at which level photosynthesis is significantly reduced. Venting can help offset the drop in carbon dioxide, but will never raise it back to ambient levels of 340 ppm. Carbon dioxide supplementation is the only known method to overcome this deficiency. Direct introduction of pure carbon dioxide is ideal, but rarely done because of cost constraints. Most greenhouses burn methane or propane to supply the additional CO2, but care must be taken to have a clean-burning system, as increased levels of nitrous oxide (NO2) result in reduced plant growth. Sensors for sulfur dioxide (SO2) and NO2 are expensive and difficult to maintain; accordingly most systems come with a carbon monoxide (CO) sensor under the assumption that high levels of carbon monoxide mean that significant amounts of NO2 are being produced. Plants can potentially grow up to 50 percent faster in concentrations of 1,000 ppm CO2 when compared with ambient conditions. Plants also emit CO2 during respiration, so it is only during growth stages that plants are net absorbers. For example a growing forest will absorb many metric tons of CO2 each year, however a mature forest will produce as much CO2 from respiration and decomposition of dead specimens (e.g. fallen branches) as used in biosynthesis in growing plants. Nonetheless, mature forests are valuable carbon sinks, helping maintain balance in the Earth's atmosphere. Furthermore, phytoplankton photosynthesis absorbs dissolved CO2 in the upper ocean and thereby promotes the absorption of CO2 from the atmosphere. This process is crucial to life on earth. Carbon dioxide content in fresh air varies between 0.03 percent (300 ppm) and 0.06 percent (600 ppm), depending on the location (see graphical map of CO2 in real-time). A person's exhaled breath is approximately 4.5 percent carbon dioxide. It is dangerous when inhaled in high concentrations (greater than 5% by volume, or 50,000 ppm). The current threshold limit value (TLV) or maximum level that is considered safe for healthy adults for an eight-hour work day is 0.5 percent (5,000 ppm). The maximum safe level for infants, children, the elderly and individuals with cardio-pulmonary health issues is significantly less. These figures are valid for pure carbon dioxide. In indoor spaces occupied by people the carbon dioxide concentration will reach higher levels than in pure outdoor air. Concentrations higher than 1,000 ppm will cause discomfort in more than 20 percent of occupants, and the discomfort will increase with increasing CO2 concentration. The discomfort will be caused by various gases coming from human respiration and perspiration, and not by CO2 itself. At 2,000 ppm the majority of occupants will feel a significant degree of discomfort, and many will develop nausea and headaches. The CO2 concentration between 300 and 2,500 ppm is used as an indicator of indoor air quality. Acute carbon dioxide toxicity is sometimes known as by the names given to it by miners: choke damp, black damp, or stythe. Miners would try to alert themselves to dangerous levels of carbon dioxide in a mine shaft by bringing a caged canary with them as they worked. The canary would inevitably die before CO2 reached levels toxic to people. Choke damp caused a great loss of life at Lake Nyos in Cameroon in 1986, when an upwelling of CO2-laden lake water quickly blanketed a large surrounding populated area. The heavier carbon dioxide forced out the life-sustaining oxygen near the surface, killing nearly two thousand. CO2 is carried in blood in three different ways. (The exact percentages vary depending on whether it is carried in arterial or venous blood). Most of it (about 80–90%) is converted to bicarbonate ions HCO3− by the enzyme carbonic anhydrase in the red blood cells. ↑ Carbon dioxide: IDLH Documentation16 August 2006. National Institute for Occupational Safety and Health. July 20, 2007. ↑ Joseph Priestley. Observations on Different Kinds of Air. Philosophical Transactions 62 (1772): 147-264 issn = 0260-7085  Retrieved July 20, 2007. ↑ Humphry Davy. On the Application of Liquids Formed by the Condensation of Gases as Mechanical Agents. Philosophical Transactions 113 (1823): 199-205 issn = 0261-0523  Retrieved July 20, 2007. ↑ Duane H.D. Roller and M. Thilorier. Thilorier and the First Solidification of a "Permanent" Gas (1835). Isis 43 (2)(1952): 109-113 issn = 0021-1753  Retrieved July 20, 2007. ↑ 6.0 6.1 Ronald Pierantozzi. Carbon Dioxide. Kirk-Othmer Encyclopedia of Chemical Technology. (Wiley, 2001) 10.1002/0471238961.0301180216090518.a01.pub2 Retrieved July 20, 2007. ↑ Historical CO2 record derived from a spline fit (20 year cutoff) of the Law Dome DE08 and DE08-2 ice cores. accessdate July 20, 2007. ↑ Trends in Atmospheric Carbon Dioxide - Mauna Loa  Earth Systems Research Laboratory.accessdate July 20, 2007. ↑ T.J. Blom, W.A. Straver, F.J. Ingratta, Shalin Khosla, and Wayne Brown. Carbon Dioxide In Greenhouses , 2002-12 accessdate July 20, 2007. ↑ Falkowski, P. and Scholes, R.J.; Boyle, E.; Canadell, J.; Canfield, D.; Elser, J.; Gruber, N.; Hibbard, K.; Hogberg, P.; Linder, S.; Mackenzie, F.T. ; Moore, B 3rd. ; Pedersen, T.; Rosenthal, Y.; Seitzinger, S.; Smetacek V.; Steffen W. (2000). The global carbon cycle: a test of our knowledge of earth as a system. Science 290 (5490): 291-296. ↑ 12.0 12.1 12.2 12.3 Solar Navigator on Carbon Dioxide. Retrieved July 20, 2007. ↑ Jerry Hannan Your Role in the "Greenhouse Effect" accessdate July 20, 2007. Butler, James Newton. 1991. Carbon Dioxide Equilibria and Their Applications. Chelsea, Mich: Lewis Publishers. ISBN 0873716248. DeSimone, Joseph M., and William Tumas, eds. 2003. Green Chemistry Using Liquid and Supercritical Carbon Dioxide. Green chemistry. New York: Oxford University Press. ISBN 0195154835. Mukhopadhyay, Mamata. 2000. Natural Extracts Using Supercritical Carbon Dioxide. Boca Raton, FL: CRC Press. ISBN 0849308194. Trabalka, John R. 1985. Atmospheric Carbon Dioxide and the Global Carbon Cycle. Washington, DC: U.S. Dept. of Energy, Office of Energy Research, Office of Basic Energy Sciences, Carbon Dioxide Research Division. ISBN 1410223744. CO2 Carbon Dioxide Properties, Uses, Applications. Universal Industrial Gases. Trends in Atmospheric Carbon Dioxide - Mauna Loa. NOAA. This page was last modified on 10 January 2017, at 20:40.